The LB-LINK upgrades network with fast AC1200 Wi-Fi. Dual 5 GHz (867 Mbps) and 2.4 GHz (300 Mbps) bands send up to 1167 Mbps total AC Wi-Fi, letting you watch movies and download files without slowing down your network. The LB-LINK AC1200 dual 2.4 GHz and 5 GHz bands are equipped with beamforming, which locates Wi-Fi devices and focuses the router's wireless signal toward them instead of sending it in all directions at once. Four Ethernet ports elivers multiple high-speed wired connections at the same time without compromising performance. Connect your smart TV, PC and streaming box to enjoy watching your favorite movies and shows without waiting. This router provides Wi-Fi coverage to many corners of a big home. You can also extend existing Wi-Fi signals with the router's Universal Range Extender Mode. 4. Why the wireless is unstable and disconnected and how to solve it ? 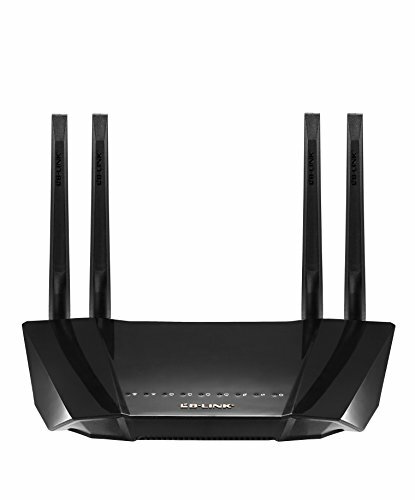 Terminal devices are close to routers,allowing the strength above-70db,change the wireless bandwidth of 2.4G wifi to 20M ,save the setting then restart the router. Dual Band:Combined 2.4GHz/5GHz speeds up to 1200 Mbps,connections for 1.2Gbps bandwidth. Next-Gen AC Wi-Fi:Supports 802.11ac standardto give you 1,000Mbps for lag-free 4K video streaming & gaming,Quickly access stored photos & music across devices. If you have any questions about this product by Jiesstore, contact us by completing and submitting the form below. If you are looking for a specif part number, please include it with your message.